Today was a cloudy day threatening rain from about lunch on. We did not get rain until after we got home from work. We know there was at least one tornado in Blount County with damage in multiple areas. We have not heard of injuries yet and are praying there are none. We also have not heard of damage on Pine Mountain but we don’t know for sure. We were accused of having too big a smile on our faces when we sang “This Is The Day” this morning at the start of devotion. This is the day we turn over leadership to our new leaders, Stel and Jodi. We didn’t think we were smiling that much. Gary brought us a moving devotion from Mathew 25:31-46. He shared two times he was visited by angels unawares. We had good discussion. Thanks, Gary for a great devotion time. 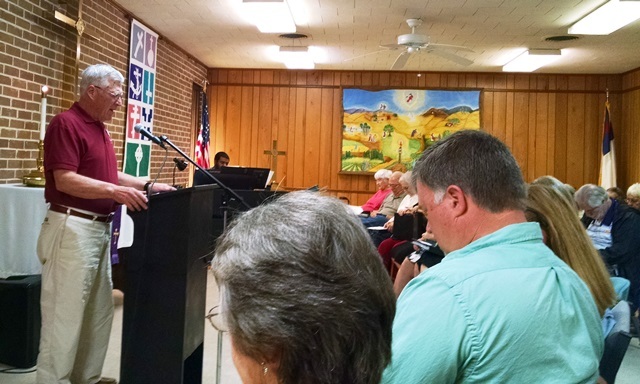 After devotion we talked about our final work day in Baton Rouge – until next month – when we won’t be leading. This has been a hard working team. 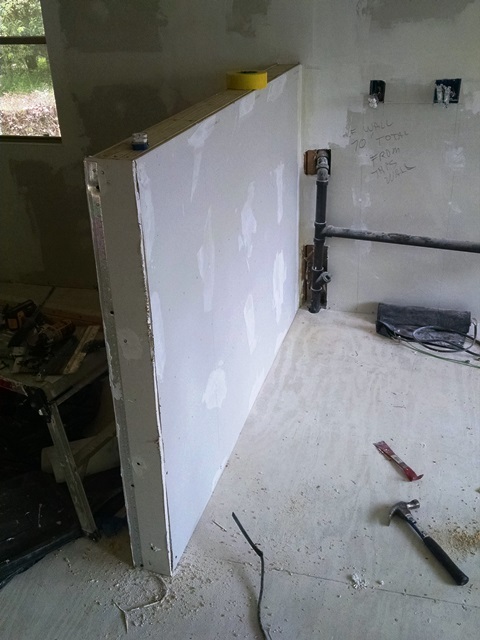 Finishing drywall is difficult work. Lots of sanding over our heads. The team was up to the task. 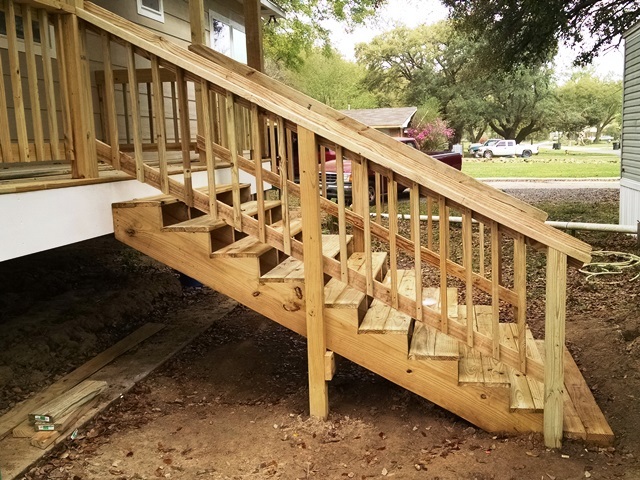 We appreciate their work so much, and we know the homeowners do as well. 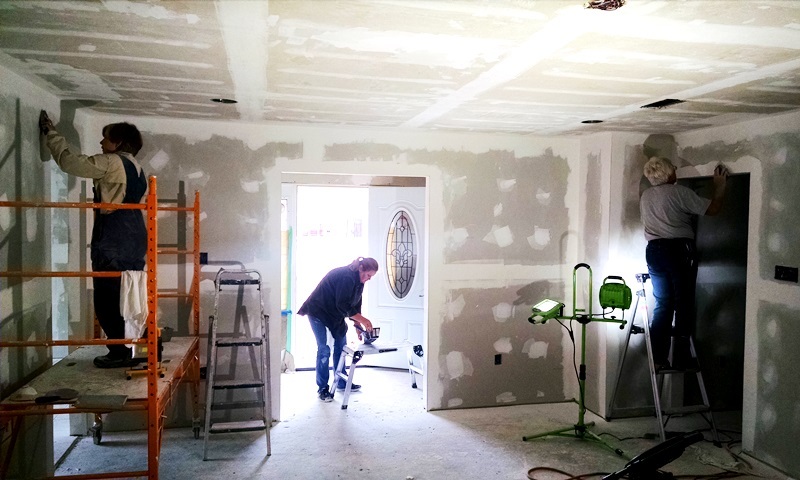 We finished our week with Mark, Lisa, Cheri and Butch back at Baker Drive finishing drywall and, at the homeowner’s request) reducing the height and lengthening a half wall they installed yesterday. The rest of the team went back to Norwich. One of the first things we did was move the huge roll-in shower down the hall and into the bedroom. Next was reinstalling the portion of the wall we had to take down yesterday in preparation of moving the shower into the bedroom. The installers have to come do some work before it gets put in the master bath. Then we resumed sanding, and mudding the ceilings and walls. Norwich is starting to come together. There is still a lot to do but it’s getting there. Tonight we gave the keys to the church to Stel and Jodi. We will be doing the final paperwork in the morning and turning that over to them as well. It has been a great four weeks and we are sure the next eight weeks well be great as well. Tonight we went to dinner with Laraine, the pastor responsible for missions in the LA conference. We were discussing the possibility of the LA Conference transitioning to a community outreach project with NOMADS after they close the disaster relief down the end of May. We hope this works out for them. Today was another really nice day in Baton Rouge. It was a little windy this afternoon but no rain again today. Three days in a row during the work week that we could work outside – that may be a record for this trip. Nice. Lisa led us in devotion this morning referencing “A Charlie Brown Christmas”. She reminded us that everyone always tried to separate Linus from his blue security blanket. Linus drops his blanket when he uttered the works “Fear Not.” The birth of Jesus separates us from our fears. The birth of Jesus allows us to drop our false security blankets. Linus picked his blanked back up. Why? Don’t we all do that too? The show ends with the kids worshiping in song. Linus then leaves the blanket at the base of the tree for good. Jesus wants us to cling to him, not the false securities we sometime cling to. We need to leave our worries, insecurities, anxiety, at the foot of the cross. We had good discussion and several of us plan to watch the movie again sometime soon. Thanks, Lisa and Mark! Today Gumby was in the mix again. 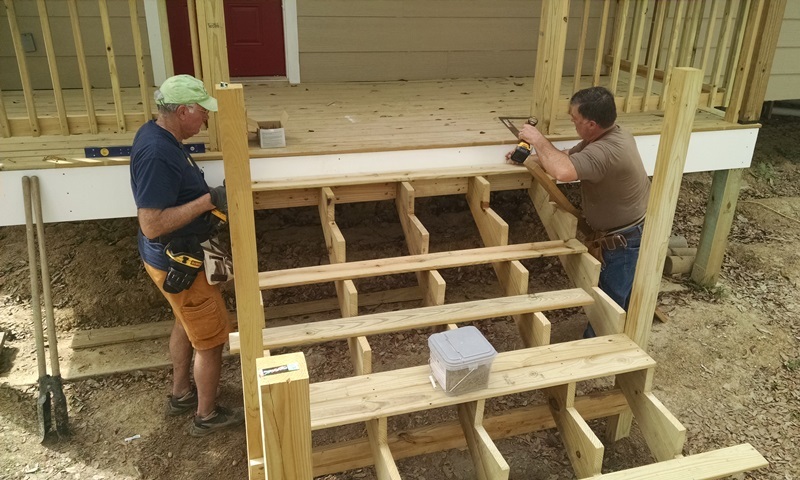 This morning Mary, Randy and Gary went back to Harry’s house to complete the hand rails on the steps. 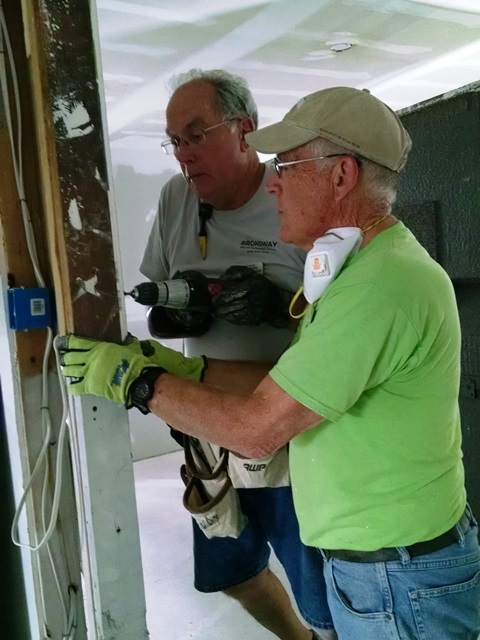 They completed the job by lunch time and joined Anne, Harry, Janet and Nancy at Norwich to continue the drywall finishing. Stel and Jodi went with Max to Baker first thing this morning. They needed to be familiar with that job site since they will take over lead this weekend. Butch, Cheri, Lisa and Mark also started the day at Baker. 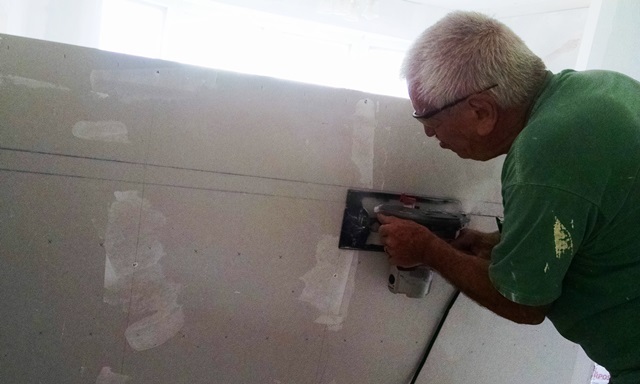 Butch and Mark were working on the water heater in Pam’s travel trailer while Cheri and Lisa were still working on drywall. After lunch we had them join us at Norwich too. 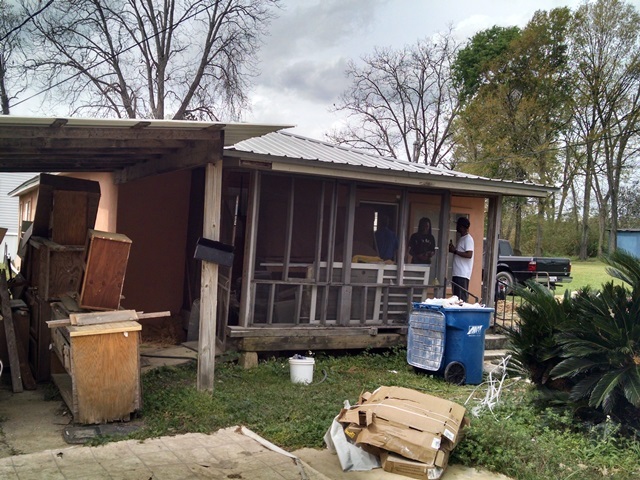 We brought all hands on deck and try to get that house finished before we leave. Gumby struck again. While we were all eating lunch together – a first for this project – we learned our scope of work has changed. 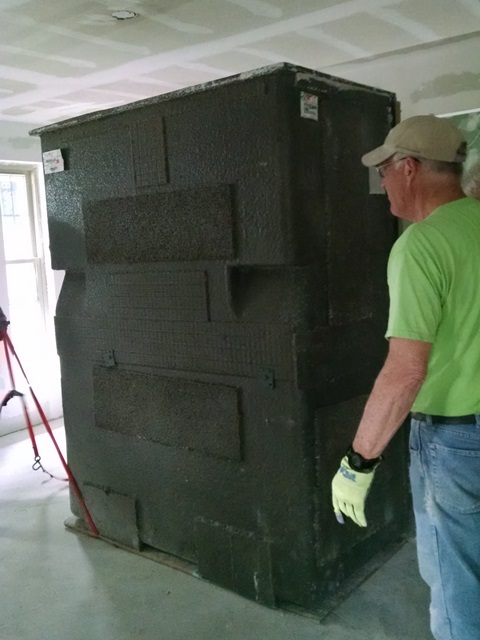 We are now going to install the very large roll in handicap shower in the master bath. We are also now going to finish the ceilings to be ready for heavy texture. They need us to move on to other houses, but the needs are growing at Norwich. So, the two bedrooms and hall that we had marked as “Done” are now not done and we will be sanding and mudding the ceilings in those places again. 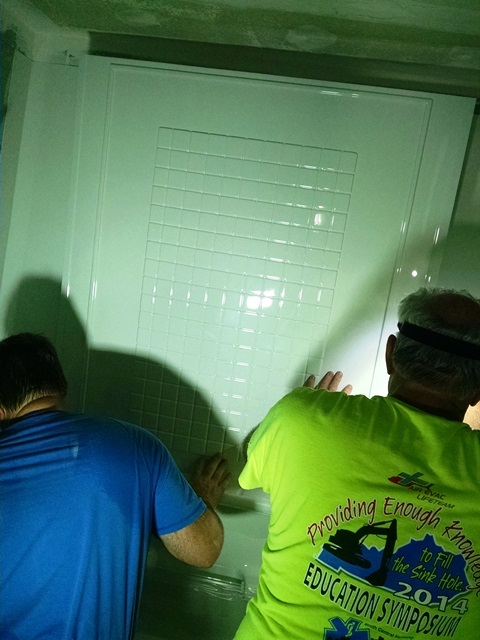 There is much work to be done to install the shower, such as frame in a wall and bust out a portion of the concrete slap and move the drain. It’s God’s work. We are just the hands and feet. Sorry, Stel and Jodi. We aren’t going to get this one finished for you. This afternoon we had to remove the back door to get the shower in the house. 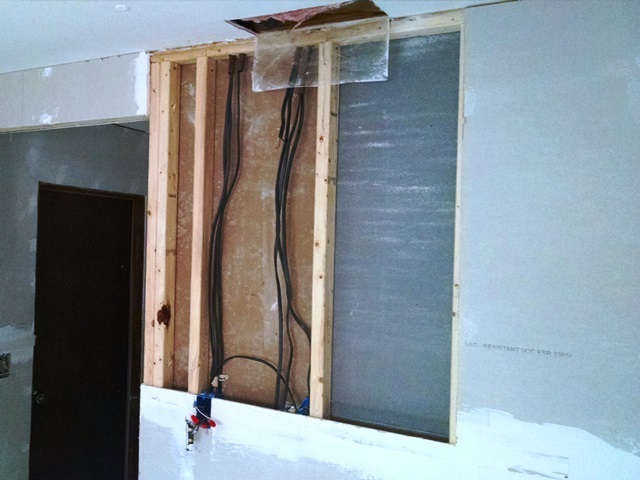 We also began removing a portion of the master bedroom wall to allow the shower to be moved to the master bath. All in a days work. This afternoon Stel and Max rode with Darryl to another house that needs work. After they got there it became evident that NOMADS will not be working on this house anytime soon. It needs the roof repaired before any inside work can be started. However, while there that did see an interesting bathroom fixture and a snake they had not seen before. 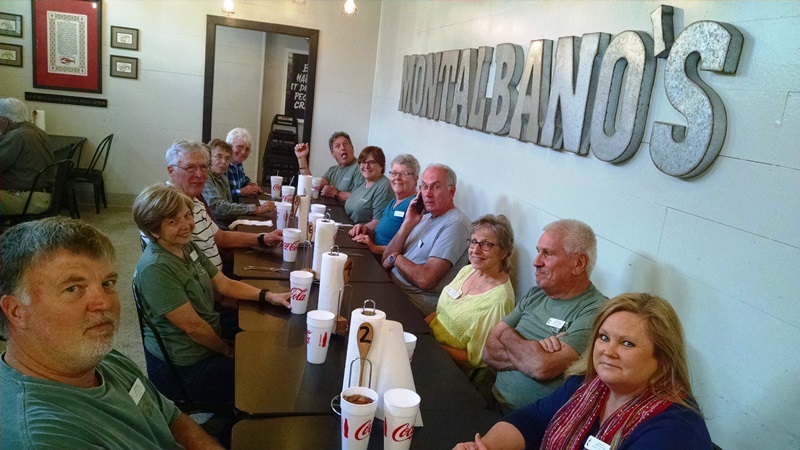 Today was Mary’s birthday so we all went out to dinner to a new-to-us restaurant, Montalbano’s Seafood. The food was very good, the company great and then we topped it off with a birthday cake. Happy Birthday Mary! It was another good day. 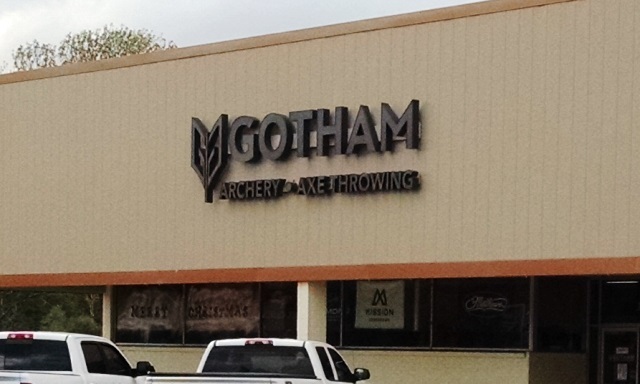 We don’t see that many axe throwing stores around home. Saw this one on the way home this afternoon. Cheri provided us a wonderful devotion this morning made even better by her beautiful singing voice. She reminded us to worship God in all we do every day and in everything we do. We were split three ways again today. 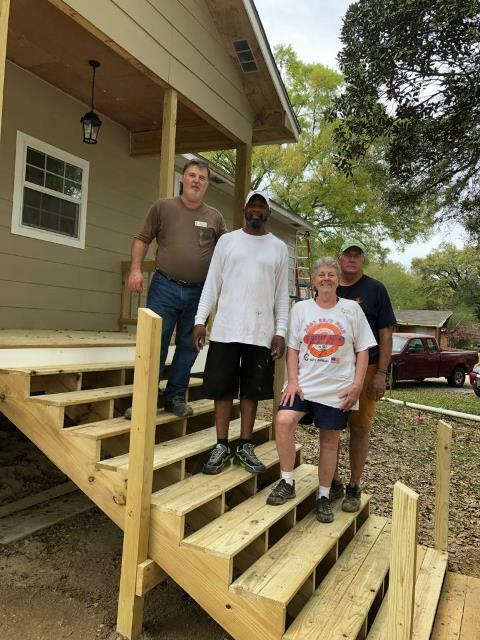 Mary, Randy and Gary went to Mr. Harry’s house to install the new steps on his front porch. They seemed to enjoy being outside and away from drywall dust. And they got to meet the homeowner who was also working on his house today. He is still living in a FEMA trailer in his front yard and really anxious to get back in his own home. 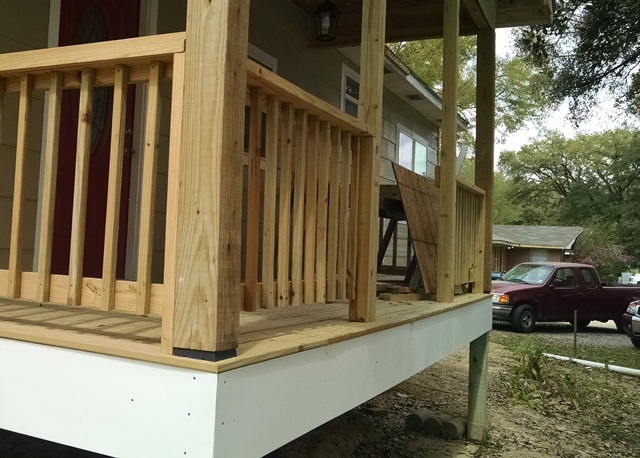 The team finished the steps and will work on the railing tomorrow. 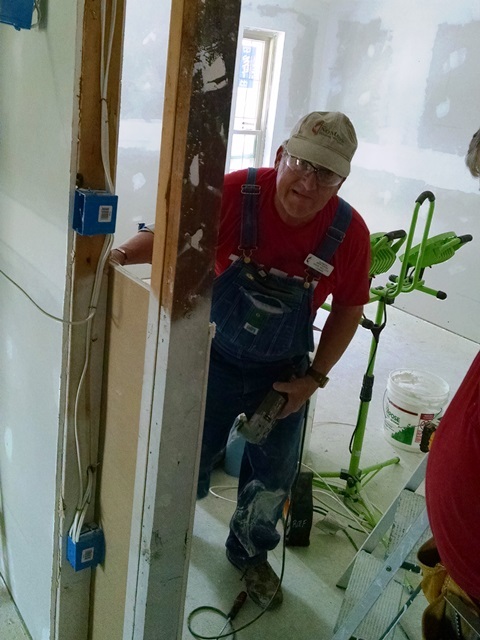 Lisa, Mark, Cheri and Butch went back to Ms. Pam’s house to build a new half wall in the kitchen, work on plumbing and, of course, continue finishing drywall. 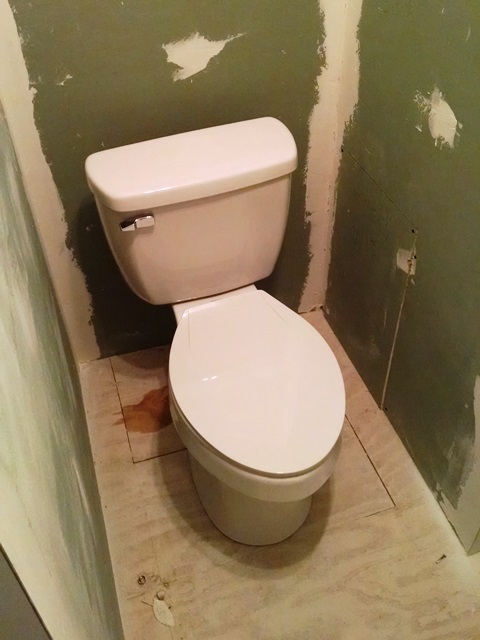 Butch installed a toilet for the crew so they don’t have to drive to the convenience store at every break. That made that job site so much better. He also, pulled the water heater from Ms. Pam’s travel trailer to see if he can get it working. It’s always great to have a plumber on the team. Stel, Jodi, Anne and Nancy went back to Norwich Dr. to work on drywall. 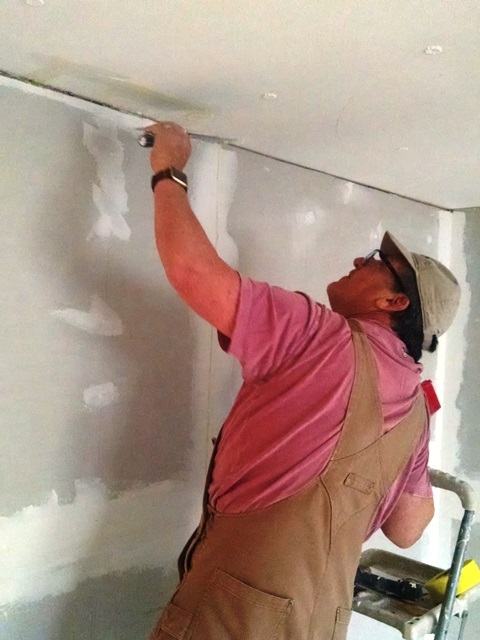 Harry took Janet to the urgent care this morning (Louisiana Crud) and then worked at Norwich Dr. Max got the other two job sites started then also worked on drywall at Norwich. We are all tired this evening. We led devotion this morning using Philippians 4:6-7 encouraging everyone (including ourselves) to hand our worries to God – and leave them with Him. The last part is the hardest. Then it was back to work. Butch, Cheri, Harry, Janet, Mark and Lisa went back to Ms. Pam’s house on Baker Drive to continue work on the drywall and electrical. 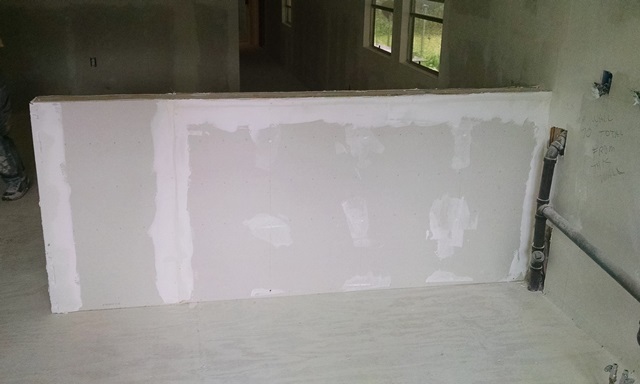 They got a lot more drywall done and tracked down and repaired the rest of the electrical problems. 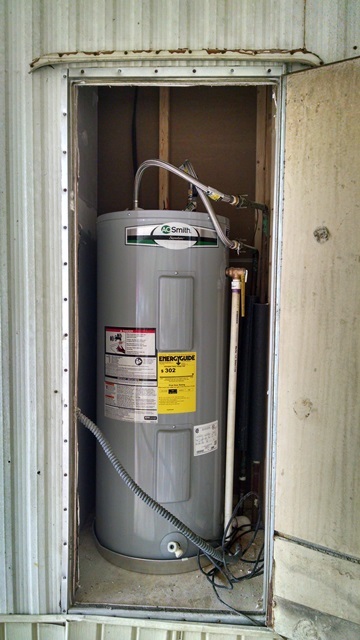 More importantly, Butch got the water heater installed and the water turned back on to the house. That is a big milestone for Ms. Pam. 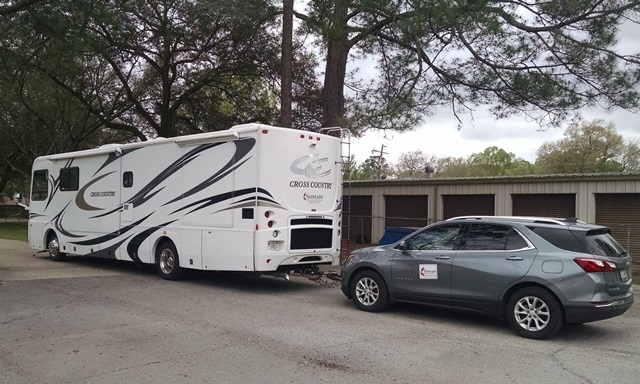 She has been without hot water in her travel trailer for weeks. One special moment occurred when we presented Ms. Pam with a card and gift left for her by the Grand Valley State University Campus Ministries students. She was truly overwhelmed. If you read last Thursday’s post, you will remember that some of the students worked at her house for a while that day. Before they left they got to meet Ms. Pam and hear her story. 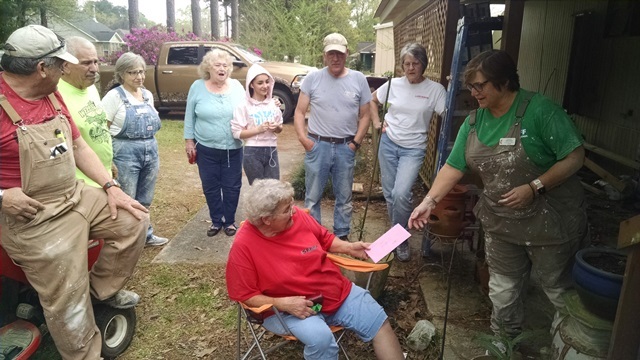 They were very touched by it and decided to give their leftover hard-earned trip money to her along with a card in which several of them had written words of blessing and encouragement. Anne, Gary, Nancy, Randy, Mary, Stel and Jodi went to Norwich Drive to work on drywall and finish installation of the tub surround. 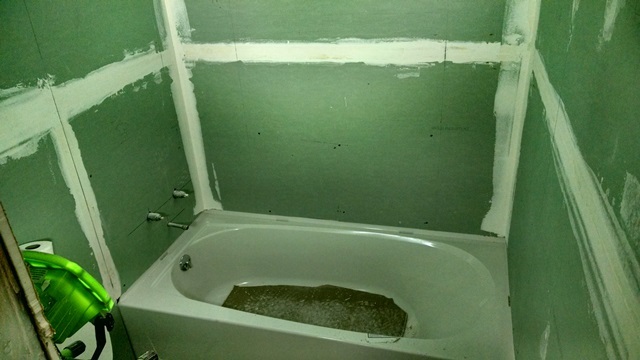 Lots of progress was made on the drywall and the tub surround was completed. Max bounced around between the houses and Lowe’s. Right after lunch Darryl took Max and Stel to look at two more houses he wants us to work on. On needs new steps and a little interior work. The other needs all the kitchen cabinets installed. The homeowner went to the store and asked for a “complete set of kitchen cabinets” without measuring anything. It will be up to us to figure out how to piece them all together and install them. It’s good that we like puzzles and challenges. 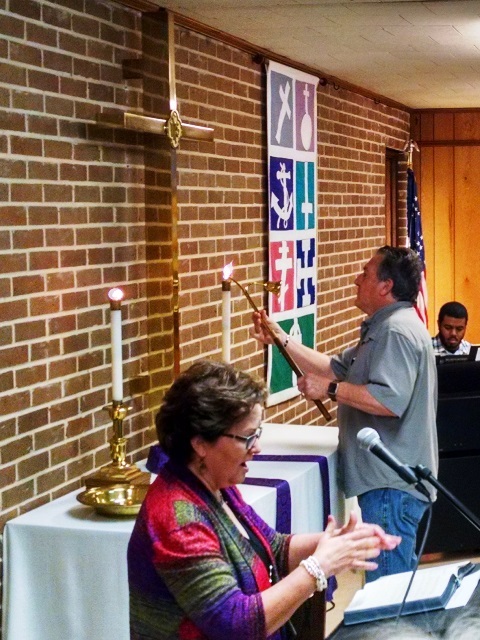 We started this morning by attending worship with our wonderful host church. Pastor David asked Mark to be the acolyte today and Harry to lead the congregation in prayer. It is nice to be made to feel such a part of the family here. 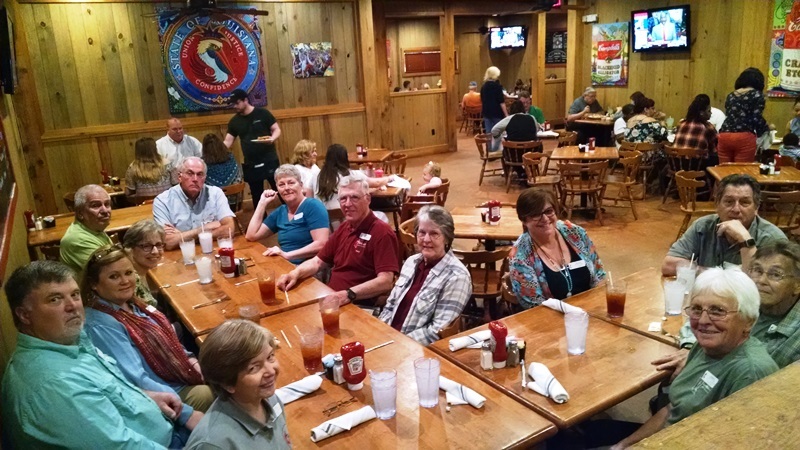 After church we all went to lunch at Sammy’s Grill and had a great time. Some of our team members had never eaten crawfish so the waitress brought a few out for them to try. Good food and good fun. We ended the day with our usual team meeting where we had a few refreshments and spent some time getting to know each other. Looks like it is going to be another great week. Last night for the first time this trip, we had a great night for sitting outside with our team. 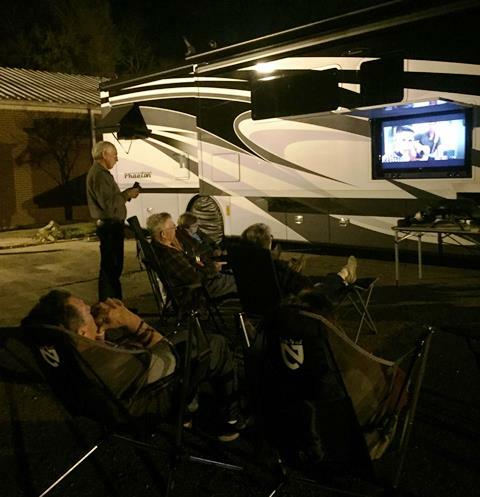 We all sat outside and watched “Forrest Gump” on our outside TV. Some had never seen the movie and for others it had been quite a while. 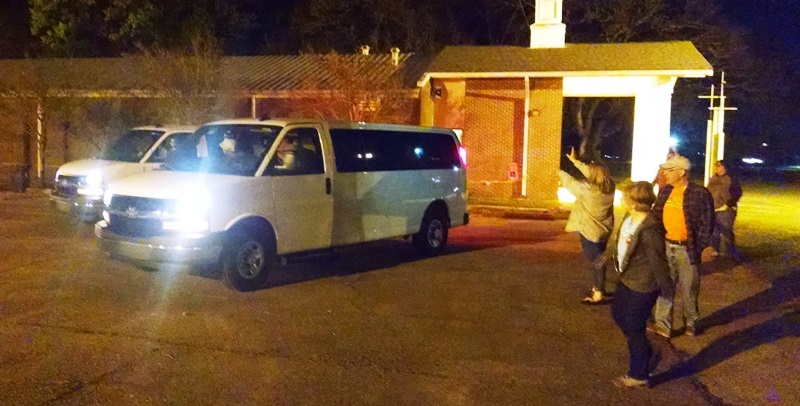 We even had an intermission because the college students came back in from New Orleans to pick up their luggage. They were going to the airport to turn in their vans and meet their bus to start their 20 hour drive back to Michigan. We were able to get some more hugs and pictures and after our prayer circle, said our goodbyes. They were such great young people. Makes you feel hopeful for the future when you work with groups like these. After they left we finished our movie. By the time it was over we had to have some blankets but is was still a nice evening to be outside. This morning it was cloudy but by afternoon we we had beautiful sunshine. It was warm with some gusty breezes. Our high today was 79. Nice. 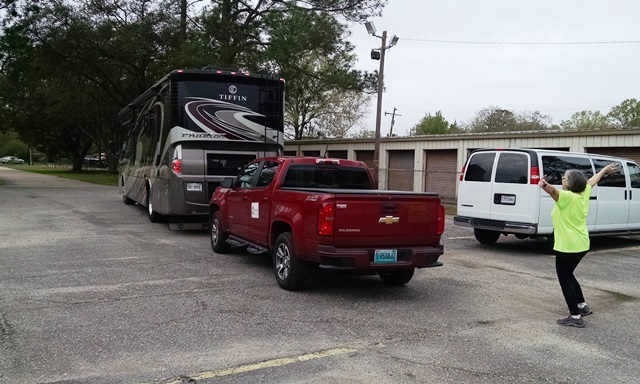 Team members were out and about playing tourist today with some visiting the old state capital and the waterfront in Baton Rouge and others making their way to New Orleans to the WWII museum along with some great food. Our new team members all arrived within a little over an hour shortly after lunch. Everybody is safely parked and the new folks have been on a tour of the agency. All the chicks are safely in the coop. It was a good day. Today was a nice day in Baton Rouge. It was a little cloudy and a little breezy but a nice warm, not too hot day. Today was a “see-you-down-the-road” day. First we said goodbyes to Dave and Rita. They are headed home to family and grandchildren. We have heard from them and know they safely arrived and hopefully we can get together for dinner when we get back to Alabama in a few weeks. Next we said goodbyes to Jean and Larry. This was our first time to work with them and we quickly grew to love them. Very talented and hard workers. 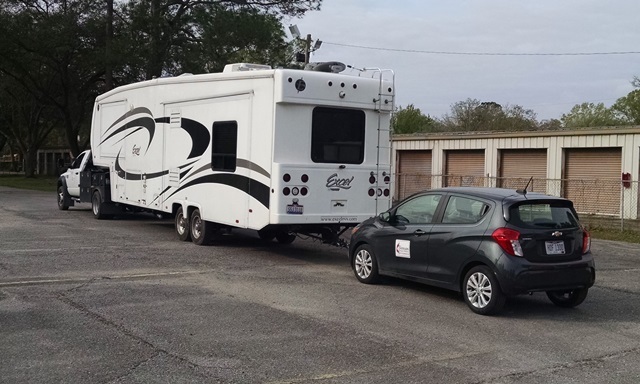 They have the longest drive today, hoping to make it to Tennessee. We have not heard from them yet. Lastly we said goodbye to Bob and Anne. 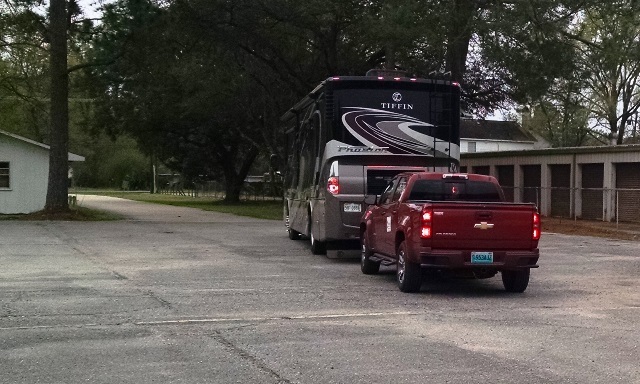 They had the shortest drive over to Fontainebleau State Park. They will get a little R&R before heading on their way. We had never worked with Bob and Anne either but also quickly grew to love them – easy folks to love. 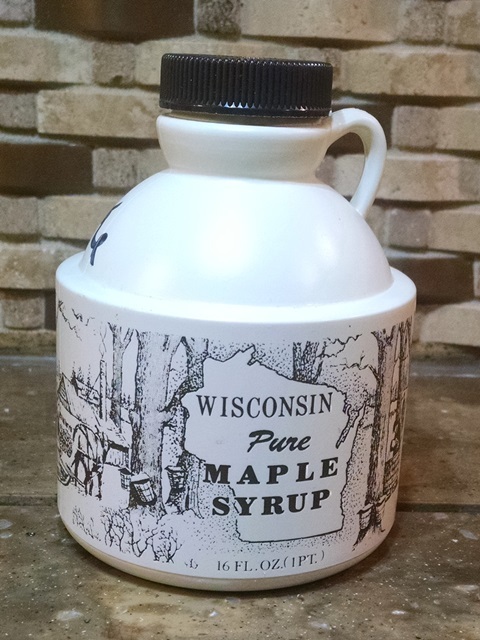 Last night they gave each of the couples here some Wisconsin Maple Syrup that Bob and his brother make every year. We haven’t opened it yet but are looking forward to some pancakes and syrup soon. Thanks so much, Bob and Anne. Thankfully they are both beginning to feel better from the Louisiana crud. We know they are safely parked for a few days too. Sad to say goodbyes but sweet knowing we may see some of them at annual meeting in September and you never know when you will work together again. We took today to rest and work around the rig. Tomorrow we have three more couples arriving. There are a lot of NOMADS traveling this weekend so please keep them all in your prayers. Author rvingwithapurposePosted on March 8, 2019 Leave a comment on “See-You-Down-The-Road” day.